It is not the earth alone that travels through the space around the Sun we also go around with it on the journey along with it through its 939,870,020 km long race around the Sun. When it travels around the Sun, the Sun does not merely carry the earth along with it all along its 314159.265 light years (one light year is about 9.5 x 10 ^12 km) long journey around the galactic bar of the Milky Way it carries us also along with it all along on its 7,889,227,200 km long lap covered by it in a year. So, in a way, we travel a whopping distance of 8,829,097,220 km every year through the space at a speed of about 30 km/second around the Sun and at a speed of about 250 km/second around the galactic bar. But do you know why we don’t feel dizzy? We don’t feel dizzy probably for the following reasons. Since the earth does not vibrate even for a moment on its way the way sometimes aeroplanes vibrate while passing through inclement weather. So we don’t even come to know that we are flying that fast in the space. Since we are not afraid of any mishap. We know that the earth or the Sun would not hit against any foreign body on their way the way we are afraid that we may hit some other erring vehicle when we drive on the road. Since we don’t come across any traffic lights on the way where we may have to stop till we get a green signal to go ahead. The routes are all clear. No cops around to check us. The Sun swings many a light years above the galactic plane and below the galactic plane en-route and it does not swing alone. The earth also swings along with it and so do we along with the earth. But alas, we don’t even come to know that we are swinging. The earth keeps on even wobbling around its axis, once every 26000 years. Of course, our life span is too small to notice such a wobble. So it does not make any difference to us. Though we may not feel that we are performing such a breathtaking journey it can’t be denied that if we could have seen ourselves flying through the space, it would have been a great fun and we would have enjoyed the flight every bit of it. The funniest part of the journey is – we perform it in complete darkness. It is only the surface of the earth that gets lit up by the Sun and the moon, not the routes of the earth and the Sun. Another funny part of the journey is the fact the earth and the Sun don’t need any energy to fly while even birds need energy to flap their wings to fly and the aeroplanes as well as missiles and satellites need some fuel or another for their propulsion. Thirdly, we know, the earth remains in balance since the gravitational pull exerted on it by the Sun balances the centrifugal force exerted on it by virtue of the speed at which it revolves around the Sun but just think, Sun too must be keeping its balance much the same way. Here is how we calculate the distances we travel through the space aboard earth. Let us begin with the journey of the Sun in the space. Our Milky Way is a spiral galaxy having two major spiral arms and the Sun is located in the inner rim of the Orion Arm as shown in the following image. 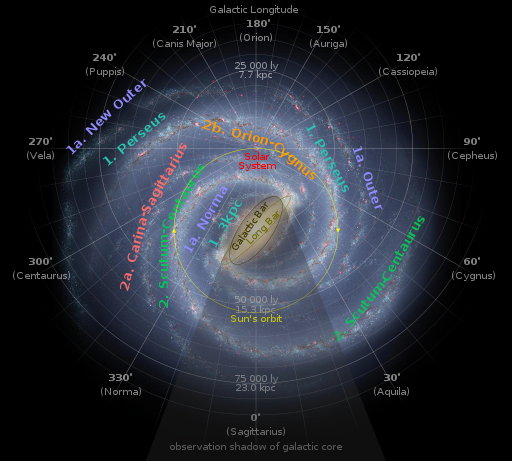 Image: http://en.es-static.us/upl/2013/01/Milky_Way_Arms_ssc2008-10.png via NASA and Wikimedia Commons. The Sun is about 26,000 light-years from the centre of the Milky Way Galaxy and is about 80,000 to 120,000 light-years in diameter and about 1000 light years thick. It takes the Sun (and our solar system) roughly 200-250 million years to orbit once around the Milky Way. In this orbit, we (and the rest of the Solar System) travel a distance of 7,889,227,200 km in a year of 365.242 days at a velocity of about 250 km/sec. Let us call this distance D1. The earth revolves around the Sun at a speed of 30.287 km/s at perihelion and 29.291 km/s at aphelion along an elliptical orbit as shown in the following diagram. Though maximum distance of the earth from Sun is 152 million km and the minimum distance is 146 million km, the semimajor axis of the orbit is 149,597,890 km and the semiminor axis is 149,577,000 km. Since the perimeter of the orbit is approximately 939,870,020 km we may say that we travel this distance, mounted on the earth every year at an average speed of 29.78 km/s. Let us call this distance D2. This way, we also cover same distance that the earth covers in a year in the space – D1 plus D2, that is, 8,829,097,220 km. But besides its journey along the orbit, Sun also oscillates above and below its mean orbit as shown below on a sinusoidal track in a harmonic fashion over a cyclic period of about 70 million years. The Sun is currently above the plane and is moving upwards and it will be roughly 30 million years before it crosses the plane again. Though earth also oscillates along with Sun, since our lifespan is hardly 100 years these oscillations do not make any difference in the distances we travel in the space during our life. So we may bypass the contribution of these oscillations to the distance covered by us during our life. The wobbling of the North-South Pole axis of the earth does not make any change in the figure of the distance we cover in space every year since the wobble cycle is pretty too long – as long as 26,000 years. However, though the centre of the earth does not move along a spiral path, we continuously trace a spiral route around the orbit of the earth because earth moves about 2,572,990 km forward along its orbit as it completes one circle around its axis in 24 hours and we are located on the surface of the earth at a distance of the radius of the earth from its centre. Taking the average diameter of the earth as 6368 km we would, therefore, trace a spiral path of approximately 6368.Cos Θ° km diameter in the space, if we may be located somewhere at Θ° N or Θ° S latitude, as shown in the following diagram. Since earth revolves at a speed of about 15° per hour around its axis even an astronaut may not be able to make out whether earth may be revolving. Of course, he can notice its movement along its orbit at a speed of about 30 km per second against the backdrop of the stars in the sky behind it besides Sun and moon. If there would have been no background of stars he would not have been able to notice even the movement of the earth along its orbit. But, no one would deny, we move a staggering distance of about 8,829,097,220 km in the space every year of our life. Voila, once we know how much we travel in a year, we may also calculate how much we may have travelled since our birth till now. How about trying it, just for the fun of it? We should feel happy that God has not thought of levying any charges for the free ride we have through the space throughout our life. Next Is Astrology True or Not?